Evelyn Summers is imprisoned for a crime that was wiped from her memory. In order for Evelyn to be released, she―along with other “reformed” prisoners―must pass seven mental, physical, and virtual challenges known as the Freedom Trials. One mistake means execution and, with her history of being a snitch, her fellow inmates will do everything they can to get revenge. When new prisoner Alex Martinez arrives, armed with secrets about Evelyn’s missing memories, she must make a choice. She can follow the rules to win and walk free, or covertly uncover details of the crime that sent her there. But competing in the trials and dredging up her erased past may cost Evelyn the one thing more valuable than freedom: her life. 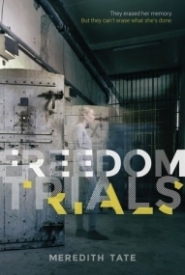 FREEDOM TRIALS by Meredith Tate is the hypothetical birth child of THE MAZE RUNNER and THE TESTING. Set in a dystopian future, Evelyn is a hack, a prisoner for a crime she can’t remember. Her jailers have wiped her memory, along with all the other cellmates. What she knows is she is bad and she’s trying to reform. The Freedom Trials is the final test that prisoners must pass in order to prove they have learned their lesson and are ready to assimilate back into society. Evelyn is selected for the Trials, along with seven other Level Threes. If they don’t pass, they will be executed, and all eight of them are willing to do whatever it takes to stay alive. I am so excited to see a pure dystopian book on the shelves again! Since THE HUNGER GAMES ushered in a genre craze, years later, publishers have been saying the genre’s dead. Meredith Tate and Page Street Publishing prove that sentiment is anything but true. This book does not necessarily push the genre boundaries or serve up a story that’s wholly original, but it offers nostalgia and meets the genre expectations that us dystopian fans have and love. The packaging of this novel is genius. The title, the cover artwork, and even the jacket copy, tell me exactly what to anticipate. They don’t hide the fact that it’s dystopian, and because of this, FREEDOM TRIALS was a must-read for me. It did not disappoint. From cover to cover, I read this book in two days. It picks up momentum with each reveal and surprise, driving the plot forward at a galloping pace. There’s not one moment that’s dull or doesn’t serve a purpose, and I enjoyed how Evelyn became a bigger anti-hero with each page turn. I’m still unclear by how the seven trials chosen by the board of directors each relate to Allard’s overall vision, but I’m hoping that will be developed in future books. For example, in THE MAZE RUNNER, the trials the gladers faced were important to creating an antidote to the Flare. There was a purpose and cause scientists could rally behind. Tate dips her toe in this, but I'm waiting for more. While FREEDOM TRIALS is extremely similar to other books in this genre, the writing and the characters validate it as its own entity. Dealing with heavy themes of redemption, guilt, and responsibility, I highly recommend this novel to any dystopian fans and those whoever felt like they couldn’t escape their past.